Thanksgiving is the time of year for roast turkey, green bean casserole, pecan pie. These ingredients feel uniquely American. But the pilgrims were some of the continent’s first immigrants, and their autumnal celebration was some of the earliest cross-cultural exchanges of food. Native Americans shared corn, shellfish and venison. The pilgrims stuffed wild fowl and created an early version of pumpkin pie. The landscape was set for America to be a nation of shared food customs. The new book “You and I Eat the Same” looks at how the continued spread of flavors and ideas throughout history has been vital for delicious food and cultural integration. As author/editor Chris Ying states in the book’s introduction, “Cuisine cannot exist without the free and fair movement of ingredients, ideas and people.” Through 19 thoughtful essays on everything from table manners to fried chicken, the book celebrates cross-cultural connections and explores how food connections are essential to an inclusive global community. Cuisine cannot exist without the free and fair movement of ingredients, ideas and people. Author and Editor of "You and I Eat the Same"
The connection between immigration and cuisine may seem acutely obvious. So many different cultures are represented in our food landscape; we live in a time where you can just as easily find traditional Mexican tacos, Portuguese chicken and Greek tzatziki as you can “Italian” options. But reading about these issues when the news is full of proposed sweeping denials of asylum for migrants and accounts of migrants being protested at our borders — made me think about exactly how we regard immigrants and their food in America. 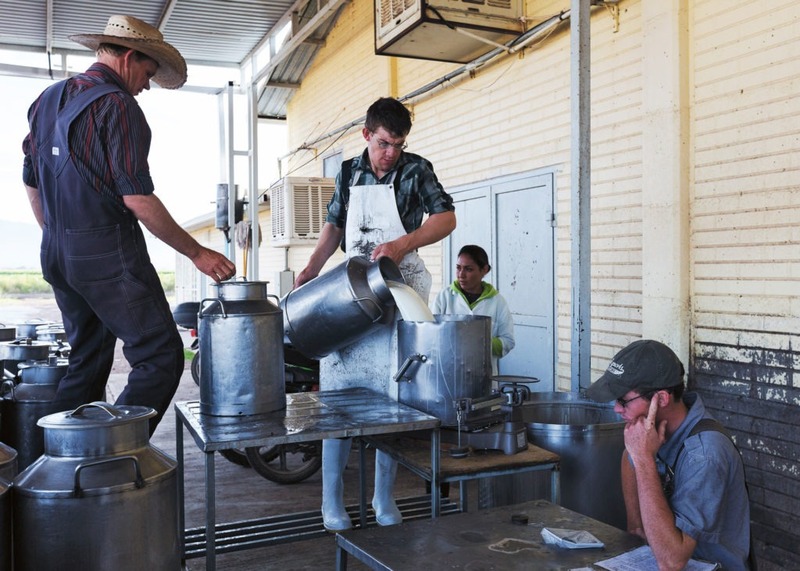 Mennonite farmers prepare cheese in Durango, Mexico. Excerpted from “You and I Eat the Same”, edited by Chris Ying (Artisan Books). Copyright © 2018. Photographs by Felipe Luna. Just like early European explorers originally brought flavors to the new world and new flavors back to Europe, ingredients that have become fundamental to American food have been spread through immigrants and their cuisines. The book’s essay “Cilantro is Everywhere,” explores the idea of cilantro as an immigrant, moving from the Mediterranean to India to China and to Mesoamerica. This exchange of flavors and recipes is further explored in “Mennonite Cheese is Mexican Cheese,” a spotlight on how a colony of Germanic Mennonites have become integral to their community’s food production and cuisine in Durango, Mexico. In the essays “There is No Such Thing as a Nonethnic Restaurant” and “Curry Grows Where Ever It Goes,” the reader is challenged to question what defines American cuisine, and to look at how racial prejudice impacts the way we describe restaurants. The essay points out that so much of the food we eat, and commonly think of as “American,” is influenced by immigrants and global cultures — from Italian spaghetti and meatballs to Chinese chop suey — and that defining American cuisine cannot be done without appreciating the global influences that are in its roots. As essay author Paul Freedman states, “More than anything else, variety and eclecticism characterize the American food scene, for better or worse.” As the essays in “You and I Eat the Same” show, it’s for the better more often than not. 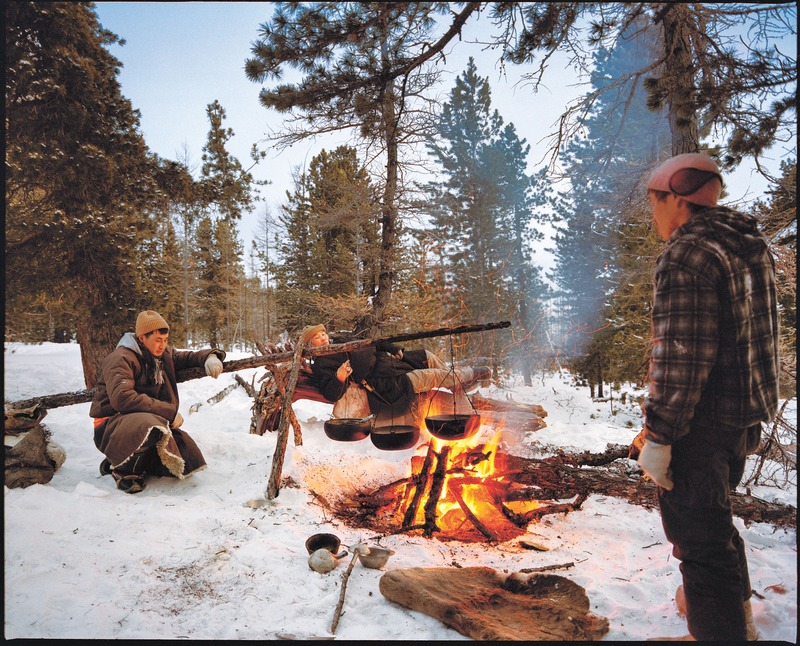 Cooking over an outdoor fire in Mongolia. Excerpted from “You and I Eat the Same”, edited by Chris Ying (Artisan Books). Copyright © 2018. Photographs by Felipe Luna. Looking at the earliest starts of our global cuisine, the essay “Your Fire and My Fire Burn the Same” takes a scientific view of fire and the ways to create it. Because, as author Arielle Johnson explains, no matter how you use the fire — from Japanese charcoal grills to American barbecue pits — we are all using the same basic method of cooking, and the same process that our ancestors were using thousands of years ago. While acceptance of these cross-cultural exchanges is vital, respecting the people, places and traditions where these foodways originate is even more vital. But in this country, one built on immigrants and immigrant culture, support for immigrants — including the laborers producing so much of our food — is under threat as SNAP benefits and aid programs for farmworkers are on the chopping block. Additionally, due to both globalization and a widespread disregard for the environment, many traditional customs and indigenous ingredients have been lost. Climate change is pushing out aboriginal crops that are vital to indigenous cultures’ way of life. Pesticide use threatens the biodiversity of the planet and the health of farmworkers and communities around the farms using it. As Ying points out in the book’s intro, “Deliciousness is an undeniable benefit of immigration.” Supporting a better food system — one that respects the migrant workers who produce our food, as well as the environment that it is grown in — is key to nurturing a robust, and delicious, food system.